Exploring On-Demand Manufacturing with Carbon, Inc. The long-term promise of 3D Printing has always been using the technology to replace traditional manufacturing as a way to make production parts. Carbon is literally turning the 3D printing world upside down by introducing real production capabilities with their systems, and now that PADT has joined Carbon’s Production Partner Program, on-demand manufacturing using 3D Printing is now a reality in the Southwestern US. 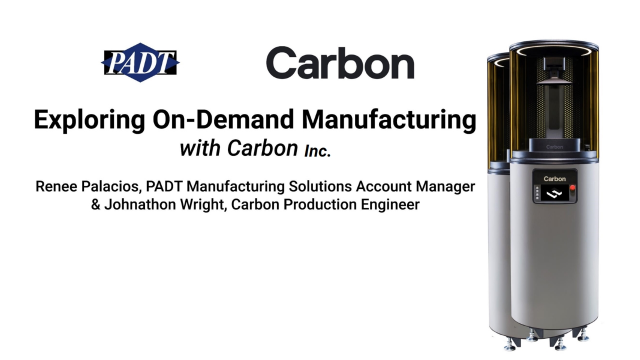 Join Carbon's Production Engineer, Johnathon Wright and PADT's Additive Manufacturing Solutions Account Manager Renee Palacios for a discussion on the various capabilities and applications of Carbon's exciting new technology. Title: Exploring On-Demand Manufacturing with Carbon, Inc.